Our first work project with NOMADS ended Thursday afternoon at Ocean Park Retreat Center. 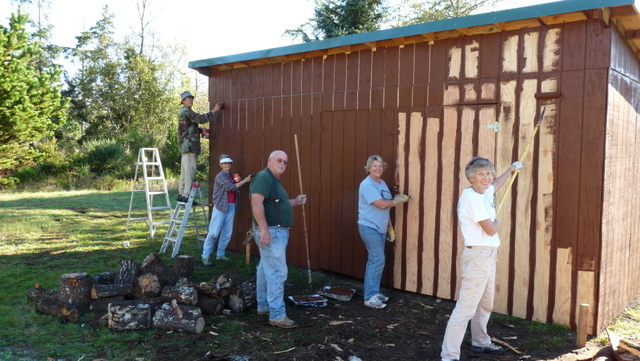 The day before, we completed painting the 10′ X 20′ woodshed and started splitting wood to fill it. Our team finished filling it yesterday, cleaned up a couple cubic yards of bark, cleaned our breakroom, then started preparing for our first trip in three weeks. Building the shed was an intrigue for Jim — he hadn’t built anything like this in a few decades. It worked out fine, for a barn. Jim made a few notes as the building progressed and looks forward to another opportunity to regain some of his long-ago skills as a carpenter. 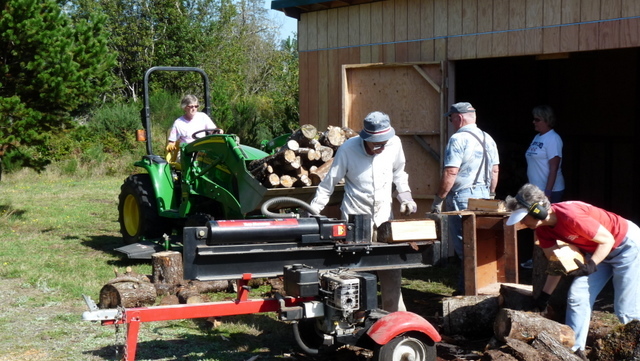 Deb learned to operate the front-end loader, hauling un-split wood from behind the shed to the hydraulic splitter in front. She developed a great feel for the tractor. Now she wants one. The salt air made quick work of highlighting every bare spot of steel or iron and created extra resistance for hinges on everything. Prepping for travels east from Pacific coast we lubed hinges on trailer and truck cover, and they don’t complain with each opening. We cleaned trailer and truck, emptied the floor mats — a clean truck makes the world brighter for these travelers. The trailer was showing a few mold spots on the inside glass so we cleaned the windows inside and out and lubed the latches — much smoother now. 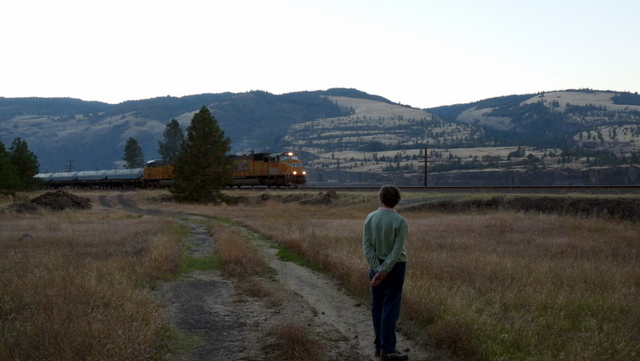 Last night we parked along the Columbia River east of Hood River, after a 200 mile drive from Ocean Park. 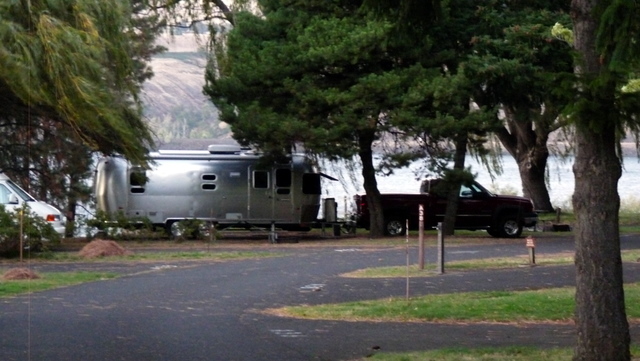 The campground is Memaloose State Park, accessed via the eastbound I-84 rest stop west of The Dalles and near MM76. We took a walk after supper and found the old quarry below and west of the campground. The quarry probably served both the railroad, over one hundred years ago, and the road builders half that long ago. Memaloose SP campground is really nice, well-arranged and landscaped. 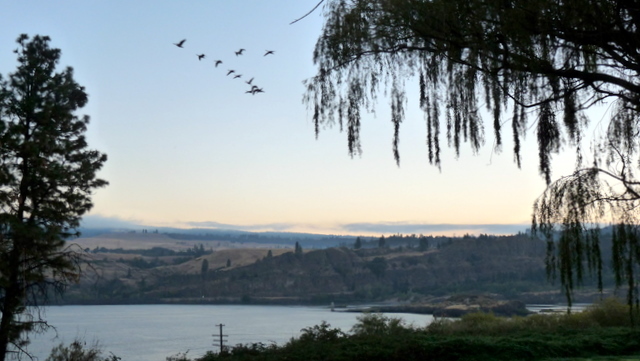 The campground is thirty or forty feet above the Columbia River, several hundred feet from the railroad tracks and 1/2 mile from the interstate highway. There are many shaded and some sunny campsites, and our choice of sites with or without electricity. We’re in the bonus season for state and national parks rates. Washington and Oregon (and maybe other states?) discount the camping fees after September. Our stay last night was only $15 for site with water hook-up in a campground with nice showers and comfort stations, paved rv parking, and nice fire ring and picnic table. And oh, what a view! This morning everything is calm and we have wall-to-wall blue skies again. Last night, and until after midnight, we had fierce winds from the west. We parked almost broadside to the wind so the trailer rocked a little. The truck helps steady the trailer — we left it hitched to the trailer since our stay was only one night. No utilities, no stabilizers, no unhitching –this morning we raised the front jack, connected the 7-way plug, walked around the trailer three times for our pre-flight safety checks, and drove off. We’ve finished our first work week with NOMADS and our reward was pizza night at Chicos in Sea View with our hosts and fellow volunteers. The pizza was just great. 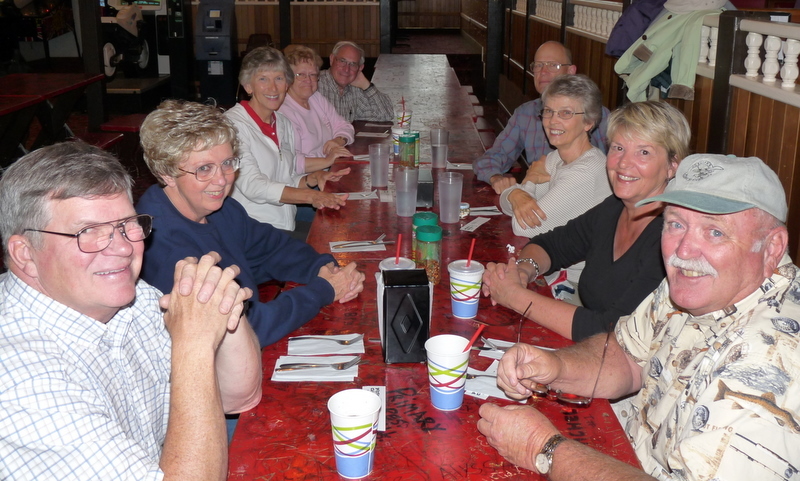 And it was nice to visit with everyone socially, to be warm and to be in out of the rain. 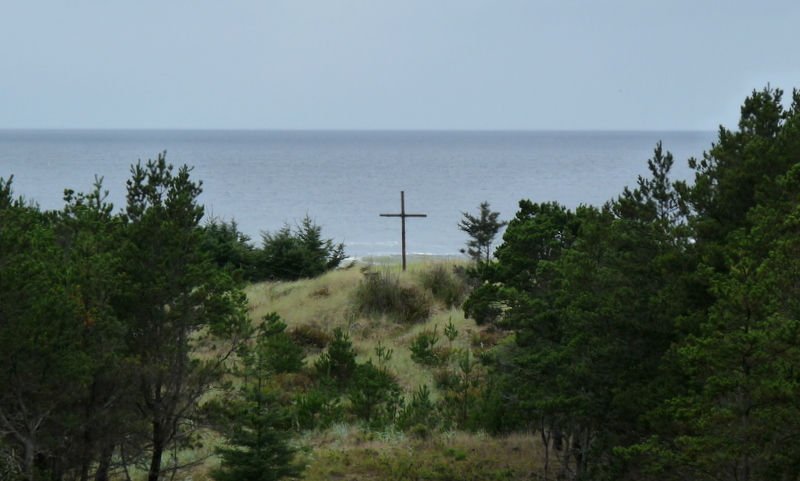 Our first day at Ocean Park Retreat and Methodist Camp was sunny. The next morning started with rain and we’ve had rain each day Tues – Fri. Today started out sunny and stayed so almost all day, warming us greatly and reminding us how nice dry can be. Did you know you can go to the Post Office on Saturdays, even when the window isn’t open, and buzz the buzzer button and they will, if they’re working (and they usually are on Saturday) answer? The Post Office in Lynden, WA, advised us to do this for General Delivery pickup. This morning we drove, first thing, to the Ocean Park Post Office. Folks were coming and going outside the building so, we thought, it must be open. Wrong, this Post Office has window hours only on Monday through Friday. But wait! Remember what happened at Lynden? So we pushed the buzzer button and the guy came to the door. We asked if we could pick up a General Delivery package and BINGO! He very pleasantly asked our names, wrote them down in the official “don’t answer the door for these people any more at any Post Offices” list. No, no, he walked back and grabbed our forwarded mail and invited us to have a great Saturday. How cool is this? This, my friends, is your customer service-oriented United States Post Office. We aren’t saying this will work everywhere. If one of you will try it in, say, Detroit or Chicago or Atlanta, and let us know how it works out we’d really be interested. But it has worked in two teensy towns in Washington state and we really like it. The sky was still beautiful, we lucked out and caught a full morning of sunshine. So we toured up the peninsula, north of Ocean Park, to Surfside and Oysterville. The peninsula is long and skinny, apparently approx one mile across and over 23 miles long. We’re staying in the upper third, so weren’t far from Surfside. We were reminded of North Carolina’s beach towns, like Topsail, in the 1970s before high rises happened. Nowadays on the formerly quiet and beautiful Atlantic beaches even the houses seem like high rises and condo buildings are jutting skyward in way too many places. Surfside is still quiet and beautiful (I probably shouldn’t be telling you all this — you might want to build hi-rises here, too). The drive around Surfside took us along beach houses perched atop, or just on the leeward side of, the dunes. The houses, mostly, are practical, pretty, and proportional to their lots, unlike so many of the starter castle beach houses springing up somewhere else. Onward along the road now to Oysterville, we now are crossing the peninsula and heading east toward Willapa Bay. 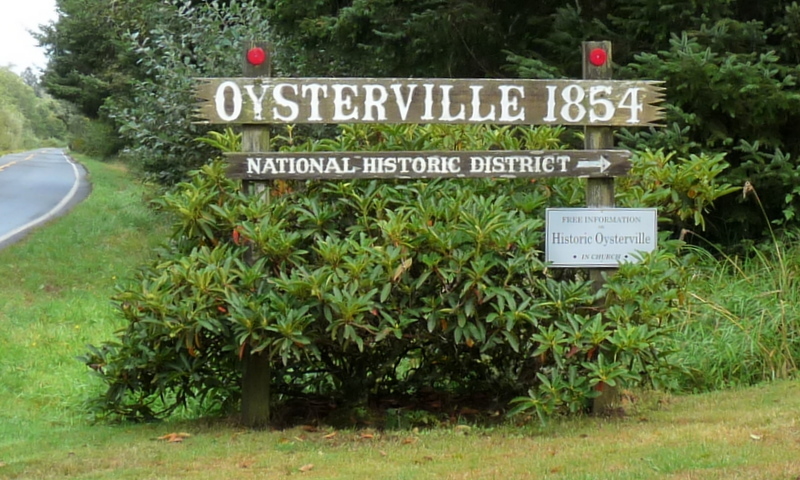 Oysterville is a town where progress halted in the late 1880s. Oysters covered the shallow reefs all around and were easily and profitably marketed to cities like San Francisco. The town had grown very rapidly and was by 1855 the Pacific County seat and a boomtown. Prosperity and progress can be fickle. The long-anticipated railroad was finally built up into the peninsula in the 1880s. But it didn’t reach Oysterville. The rail only went as far as Nahcotta, four long and devastating miles south of Oysterville. People left, population declined, progress halted for Oysterville. 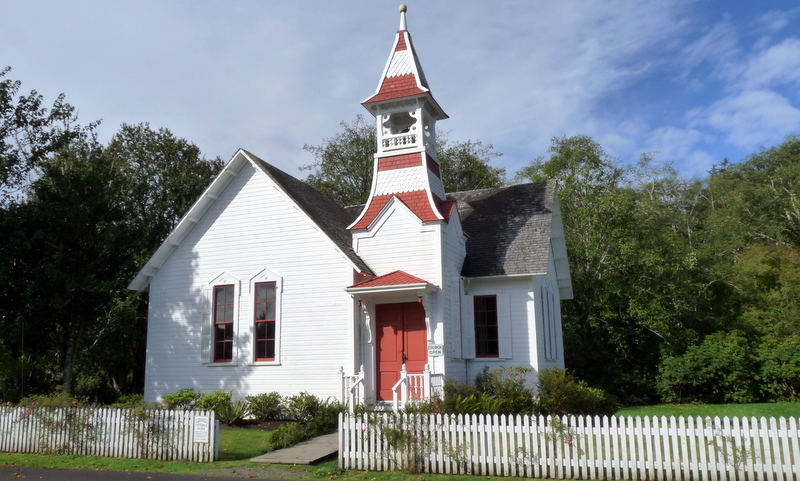 Today we visited the Oysterville Historic Church, built 1892. We visited the old Cannery site, now home to the Oysterville Sea Farms and a really nice fresh seafood store. And we stopped to read the historic plaques outside a half-dozen historic homes or sites in Oysterville. The sun was still shining brightly, the skies a brilliant blue, as we turned back to Ocean Park Retreat and Methodist Camp. The campus is serving several groups this weekend, providing lodging in cabins and meals prepared either by the groups or by Retreat staff. We’re eating a few staff-prepared meals and they are delicious. And we enjoy the opportunity to get to know some of the other folks staying here. This evening we walked up to the dining room and were glad to see this view over the Pacific Ocean. We took our time dining and drinking coffee afterward, so didn’t have time for the walk we should have taken. But the skies were threatening and we just didn’t feel like striking out for a walk when we could stay inside, warm and dry. This visit isn’t going to be long enough, unless it continues raining every day. On our way home from supper, walking down the hill, the rain started up again. It’s a fine mist, softly blown in the winds, then it’s a heavy coating of rain. The rain doesn’t so much move in with a strong wind or big gray clouds. The air just starts being very wet and we realize we can see the rain blowing down all around. Rain or shine, we’ll get out and find our way around. We have trails and 2,000 feet of beach front to explore on this campus, and 23 miles of unobstructed beach we can walk or bicycle when we want. 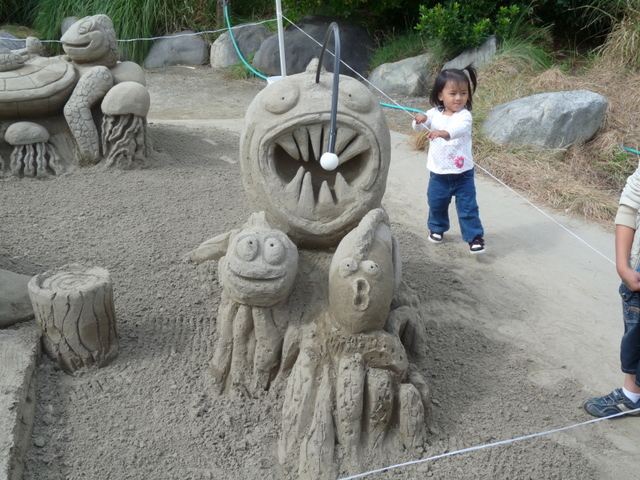 Ocean Park is a gorgeous place and we’re looking forward to finding a lot to like about it. We have arrived! 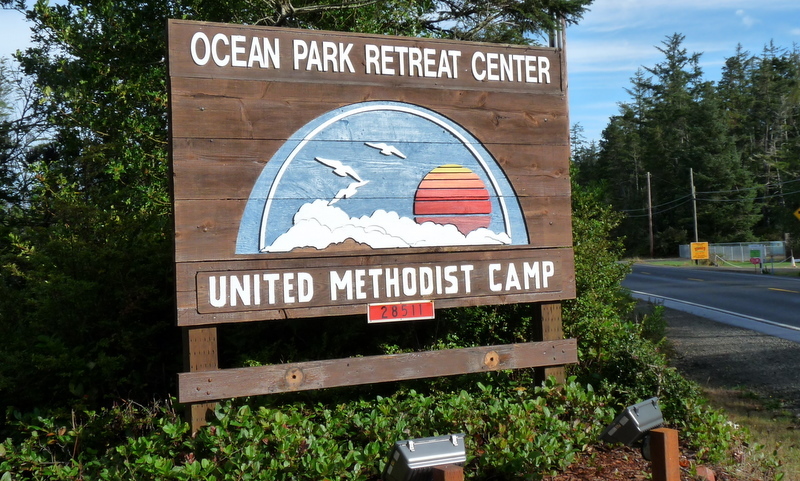 In Ocean Park Retreat Methodist Camp, that is. Outside is wall to wall blue sky and full sunshine, the first day like this we’ve seen in a week or two. There’s a nice soft breeze with 61 degrees outside. We have every window open an inch and both roof vents wide open, and the inside temp is a very comfortable 76 degrees. Jim told you wrongly yesterday when he said we weren’t going to have a campfire before we left Mora Campground in Olympic National Park. As we were walking before supper, we agreed the weather had lightened up a little and we would both enjoy a little fire. Jim split some kindling, Deb laid and lit the fire, and we had a roaring fire before it started raining again. The fire was so nice we pulled out our chairs and enjoyed the warm dancing flames. Then we realized, this could be our last campfire of 2010 unless we stop in a national or state park on one of our remaining long-distance drives. We’ll have a two or three-day trip from here to Boise at the end of the month, a three-day trip to Mesa mid-October, and that’s it for 2010. So we made the most of last night’s fire. We had reserved one small bundle of dry hemlock (of three we had purchased) and had scavenged leftover wood from departed campers’ fire rings over the past week. With plenty of wood we quickly had a hot fire. It was so nice Deb suggested we eat by the fire. Jim grilled a nice marinated chicken breast and Deb made a wonderful avocado, tomato, and romaine and leaf lettuce salad. Just as we finished eating the rain started falling more steadily. Deb grabbed an umbrella and we stuck it out for a couple of hours, staying very warm and dry despite the outside temperature around 50 (and really wet). It was nice, and if we don’t have another for awhile this one will serve as the right campfire memory. Ocean Park Retreat (OPR) is an 80 acre campus a mile north of Ocean Park, Washington, on the peninsula west of Willapa Bay, sort of opposite and south of Aberdeen on the east side of the bay. Oysterville is just north of OPR, and we hope we will be able to take advantage of these great sea treats. We are here for a three-week work assignment with NOMADS, a bunch of RVers willing to serve with time and talents in various host sites across the country and beyond. Some might be full-timers, two other couples here aren’t. Folks typically sign on for a three-week assignment or can work as drop-ins where a church or camp requests the help. Three other NOMADS couples already are here and were at work when we arrived today. They have been staining the exterior of a large building at OPR and we’ll start helping with this tomorrow morning. From the looks of the building we might do nothing else for at least a couple of weeks. Whatever the tasks, we’re here to help and to get to know the other NOMADS. We’ll have time to explore, including trails and 2,000 feet of seashore in the Camp, and we’ll try to find our way all up and down the peninsula. Two years ago we stayed a couple of days in a small campground in Ocean Park and toured a little. We’re allowed three days off each week for our three week stay, so we should have plenty of time to thoroughly find our way around. Just a short post to update our location and, more significantly, our weather! It’s nice to have an entire afternoon of bright sunshine. Maybe we’ll see more of the sunshine and blue skies, we’re due for it. And Ocean Park Retreat seems like a great place, both for volunteering and for enjoying the weather. We had a great stay in Vancouver, B.C., last month, staying two weeks in Burnaby Cariboo RV Park (BCRV). I mentioned before BCRV is a full-featured RV Park (although it lacks tennis courts, darn it). It is, by far, our preference of the two major advertised Vancouver RV parks. Our reasons might not be valid for other people, but after trying Capilano RV and BCRV two years each, we’ll stick with BCRV for quiet, privacy of sites, indoor pool, comfortable lounge. Whidbey Island has several RV parks and at least two state parks with camping. We later learned there is also a very reasonable city park with camping in Oak Harbor we might try next time. Oak Harbor is a nice little navy base town with all the urban things you need but perhaps not some you want. It suited us very well and is 6 miles from Deception Pass and Quarry Pond State Parks. 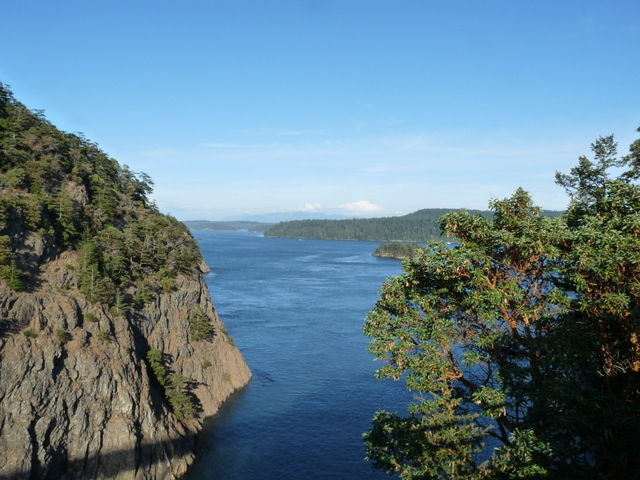 Our intended campground was Deception Pass on Whidbey Island, an absolutely gorgeous area. But without reservations it wasn’t going to happen. Schools hadn’t resumed session yet and the weather was almost perfect for campers so the campgrounds were peaking. Serendipitously we somehow thought to ask, “is overflow camping available?” And it is, across Washington route 20. Quarry Pond campground formerly was privately owned. The state purchased it, maintains it, is mapping it, and apparently will add it to their campgrounds on the reservations system. Too bad — we might not have found anywhere to camp without this first-come, first-served campground. It’s a very dusty campground and isn’t cheap. The roads are gravel and despite the 15mph speed limit the high amount of camper traffic generates a tremendous thickness of dust on the camper and truck. On the other hand, the showers are free and hot as long as you keep pressing the 1-minute button. We spent a day in Anacortes walking throughout the small business district and spending the most time in West Marine and bought nothing (they’ll start charging us when they realize this is our entertainment). 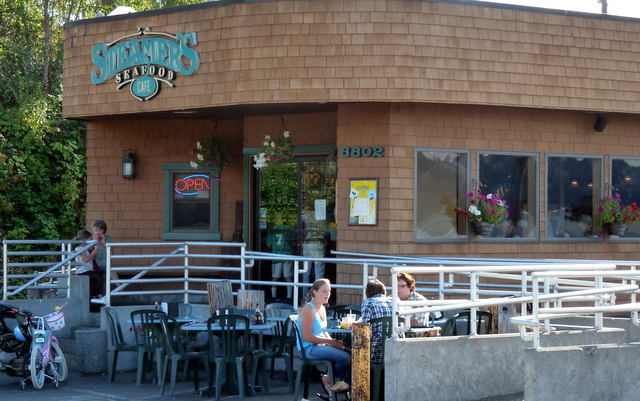 Anacortes is a pretty town with the ferry to the San Juan islands and other points and a tremendous marina. A few days we ran errands in Oak Harbor, catching wifi and enjoying coffee at Honeymoon Bay Roasting Company’s shop near Safeway. Their wifi hotspot is great, staff are friendly, the coffee is super and maybe the scones are too, most days. Jim ate something bad or caught a bug, we tired of the dust, and had walked enough in both campgrounds and enjoyed the views from the gorgeous bridge over the mouth of Cornet Bay. Less dust (and a happier Jim) might have allowed us to stay longer, but we were looking forward to visiting the South Puget Sound area. Washington Land Yacht Harbor (WLYH) has 165 rv spaces in their terraport and charges only $15 per night for WBCCI members. Golly, a little more than half the price at the state park and we have neither the traffic nor the dust. We don’t have showers, but we do have very good wifi for free at WLYH. And we’re close to Lacey and Olympia, nice and nicer, and we’re 25 miles from Tacoma. Jim’s cousin lives in Des Moines, WA, and agreed to meet us halfway in Tacoma for dinner last Friday. We killed time browsing at Tacoma Mall before visiting the Tacoma Narrows Bridge (Sturdy Gurdy) and meeting Jan for dinner. Tacoma Mall was dandy. We spent too little time in REI, one of our favorite all-time stores. REI has all the stuff we wish we used and don’t need unless we start hiking and backpacking a whole lot. We have what we need now, and would have to wear it out before we can justify replacing any of it. So we bought nothing at REI. We were short-time at REI partly because we had something else on our minds — the Apple Store at the mall. And there we spent the most time, broken only by bathroom breaks, a shared pizza slice for lunch, and right back to exploring Apple stuff. It was fascinating for us. We had never touched an iPad, never really paid much attention to Macbooks, and didn’t know a thing about the equipment or the accessories. Pretty neat to go in and see every color of iPod Nano, turn them off and on, listen to them with NICE headphones, browse stuff on the wifi-connected iPads, and even try out the Macs. We absorbed all we could in a few hours and know very little more now. 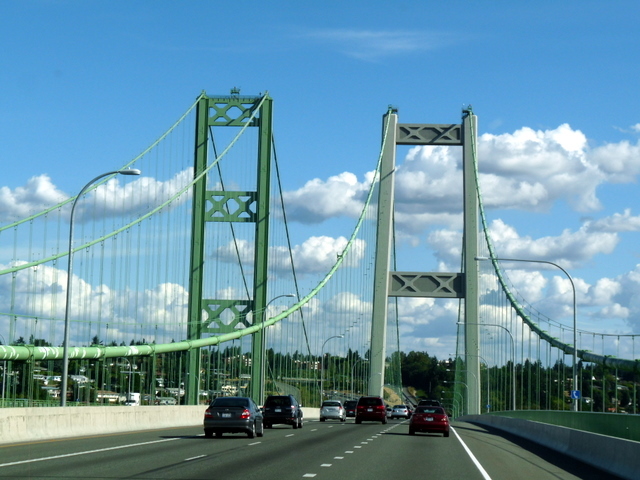 And we were off to visit the Tacoma Narrows bridge before dinner. Did you know how tricky these Washington folks are? They let you drive across the Sound on the bridge for free. And you can’t come back unless you pay. No warning signs that we noticed, you just get to the other side and here’s a big old toll station. Gotta pay for it somehow, especially when you the first one lasts only four months before it crashes into the Sound. Very very expensive. The failed bridge was known as “Galloping Gertie” for her behavior during windy days. The designers and citizens were unprepared for this bouncy bridge where, apparently, you would lose sight of the car in front of you as the bridge oscillated wildly up and down throughout its length. But didn’t last long before it crashed into the Sound on November 7, 1941. Washington State paid off the replacement bridge a decade ago and are still paying for the second (east-bound) bridge. We’re glad to help with our $4, it was worth it for the drive over and back. Dinner was at Steamer’s, a nice local restaurant on the Sound’s edge. We sat outside a while watching boats and birds before time to go inside and stake out a table. They have several microbrews on tap and a nice, if limited, menu. We all did well on our choices. Jim’s oysters were not superb but were good. Debbie’s tempura-fried halibut was very yummy, and the views were almost as good. 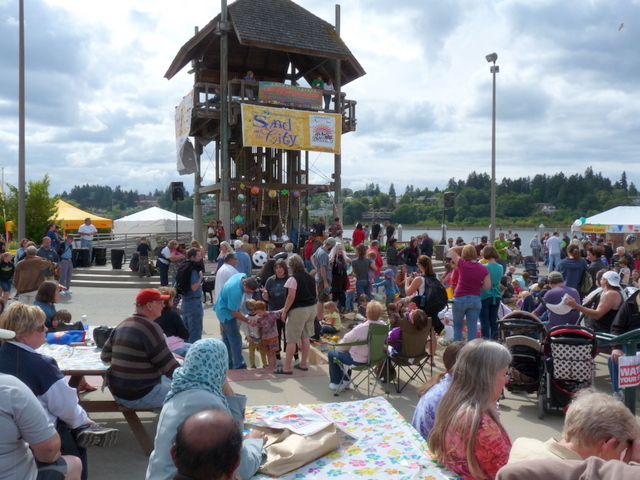 We lucked out in Olympia Sunday afternoon and caught their annual Sand in the City festival. Olympia’s pretty nice anyway, and we caught the well-attended Hands On Children’s Museum special event attracting thousands of people. Parking is free, weather happened to be perfect on Sunday, and the sand sculptures were as good as you expect from these traveling sand sculptors. The event crowd helps the adjacent farmer’s market, maybe a little too much for us. We didn’t think of the timing and completely missed out on cherries and berries, and the bakers had put away their bread. Their till was filled hours ago, thank you very much. So we plopped down in front of Dancing Goats espresso bar for a cup of very very strong coffee and a borrowed Sunday paper. The perfect cap to an afternoon of walking around the plaza. We’ve refilled propane tanks, torqued the wheels, changed the truck’s oil and filter, had the warranty service on the windshield washer heater (who even knew we had one? ), had our hair cut today, washed and waxed the truck, and re-mounted the 7-way plug under the bumper to better clear the mudflaps. Our mail caught up with us, Debbie received her birthday cards and we’re good for a couple of weeks before we’ll have read all the periodicals. We landed six of seven packages we ordered, including HF antenna parts, a CD, our mail, the MAC and two software packages for it. This has been a productive stop for us, just right for refilling all those things you need when you’re full-timing. We leave tomorrow morning, 9/2, for Olympic National Park. This has been on our radar a long time and we’re glad to finally get a chance to visit and stay. Two years ago we enjoyed a week in Port Angeles. The Methodist Church is really sweet, the ferry trip to, and visit in, Victoria is fabulous, and we had a really nice time. But we missed seeing the Hoh Rain Forest. Now’s our chance! We’re spending, depending upon the weather (and then our tolerance for whatever it presents), between a week and ten days on the Olympic Peninsula. We think we’ll find wifi somewhere up there and you’ll hear from us soon. If we don’t write before Sept 13, we didn’t find connectivity.